Singapore. 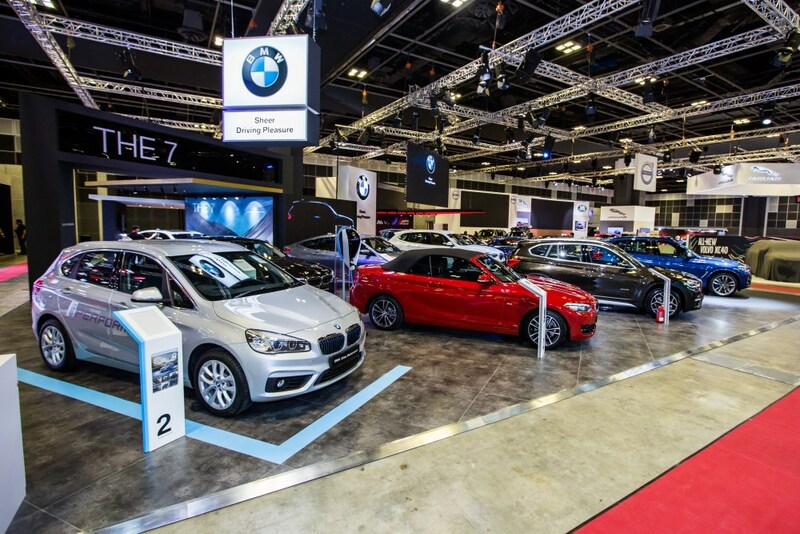 Performance Motors Limited and Performance Munich Autos will showcase its latest range of BMW and BMW M models at the Singapore Motorshow 2018 from 11 to 14 January 2018 at Suntec Singapore Convention Centre (Level 4, Booth 120). The dynamic handling qualities of the all-new BMW X3 are rooted in its ideal 50:50 weight distribution, its meticulously honed chassis and the xDrive intelligent all-wheel-drive system. It is interlinked with the Dynamic Stability Control (DSC) which means that the power split between all four wheels can be constantly varied to always produce the handling characteristics for which BMW is renowned, even when the driver is accelerating. The large three-dimensional kidney grille and rear lights reinforce the muscular design of the all-new BMW X3 while its interior boasts a lavish finish with Vernasca Leather sports seats and a driver-focused cockpit. Another unique feature that the new BMW X3 boasts is the Remote 3D View function, which can be used to beam a three-dimensional view of the car’s immediate vicinity directly to a smartphone. Being a rear wheel drive vehicle and coupled with an almost perfect (50:50) weight distribution, the BMW 116d 5-Door Hatch is extremely fun to drive and easy to manoeuvre in the city. It comes with an extensively modified front and rear-end design, as well as a sophisticated feel in its interior and fresh reserves of power under the bonnet. It has a luggage compartment capacity that can be expanded from 360 to 1,200 litres simply by folding down the rear seats. This would make it extremely handy for owners with an active lifestyle who may wish to transport their bicycles or other sports equipment. The BMW 116d 5-Door Hatch is also extremely fuel efficient and can travel up to 1,000km on full tank, which would be sufficient to take you from Singapore to Kuala Lumpur and back on a single tank (710km) for that short weekend getaway. As the world’s first premium compact model to offer up to seven seats, the BMW 216i Gran Tourer fully meets the mobility expectations of young families for whom not only practicality and versatility are important selling points, but also sportiness and a leisure-oriented lifestyle. A standard third row of seats offering generous space for two additional passengers highlights the supreme flexibility of the BMW 216i Gran Tourer. Its high degree of everyday practicality and flexibility is also reflected in its numerous storage compartments and spaces. The BMW 218i Convertible is stunning with the roof up or down. The electrically operated fabric soft-top slips down into the body to create a boat-deck look and offers excellent acoustic comfort when closed thanks to additional insulation. Opening and closing of the softtop takes just 20 seconds and can be performed at speeds of up to 50 km/h. The Sport Line on the BMW 218i Convertible allows the car to exude a sense of sportiness like none other. BMW ConnectedDrive offers a whole host of Services and Apps to make your journey safer and more enjoyable. The BMW 225xe – a BMW 2 Series Active Tourer variant with eDrive – delivers a combination of sporting ability, economy and everyday practicality unique in its segment. With its plug-in hybrid drive system, the BMW 225xe combines BMW EfficientDynamics with comfort, driving pleasure and all-wheel drive, and brings versatility and generous levels of space together in a compact vehicle. It is perfectly suited for use in urban areas and for family leisure activities. The BMW 225xe uses its combination of BMW eDrive and a 1.5-litre three-cylinder BMW TwinPower Turbo engine to offer both an electric driving experience and unrestricted mobility. The BMW 3 Series Sedan has been the benchmark in driving dynamics for generations. The 1.5-litre three-cylinder petrol unit and 8-speed Steptronic transmission enables the BMW 318i to manoeuvre and zoom pass traffic with ease, while the Navigation System Professional with Real Time Traffic Information keeps the driver precisely informed of the traffic situation on the planned route and potential alternative routes at all times. The BMW 520i sets new standards in the automotive world with its elegant appearance and state-of-the-art features like the best-in-class drag coefficient of Cd = 0.22, Adaptive LED headlights, wireless charging for mobile devices and 10.25-inch Navigation system that can be controlled intuitively using the iDrive Controller, voice command, gesture, or by touch. The new two-litre four-cylinder in-line engine in BMW 520i develops peak torque of 290 Nm and maximum output of 184 hp. Working in tandem with rear-wheel drive, the BMW 520i accelerates from 0 - 100 km/h in 7.8 seconds on its way to a top speed of 235 km/h. The all-new BMW 640 xDrive Gran Turismo is designed to provide the long-distance comfort of a luxury sedan, aesthetic appeal of a coupe and practicality of an SAV. The standard BMW Driving Assistant Plus with personal co-pilot allows for a more relaxed drive while the rear axle air suspension offers comfort to the passengers with no compromise in performance. With sturdy proportions, powerful presence and dynamic lines, the BMW X1 sDrive18i has a highly fuel-efficient engine powered by BMW EfficientDynamics technology. In terms of design, its SAV DNA is clearly reflected in its interior, with its significantly improved space and variability, its premium ambience plus full-LED headlights and its automatic tailgate operation. Details such as the side air blades on the tailgate and the Air Curtain integrated into the air inlets at the front also boost aerodynamics and reduce fuel consumption. Its highly flexible interior enables the transportation of bulky items such as bicycles or other sports equipment. The all-new BMW X3 M40i heralds the arrival of the first ever M Performance Automobile in this model series. The new range-topper is powered by a new M Performance six-cylinder in-line engine, which succeeds in blending its insatiable appetite for revs and sublime pulling power with exemplary smoothness and efficiency. The 3.0-litre unit generates output of 360 hp and peak torque of 500 Nm. This performance armoury allows the all-new BMW X3 M40i to sprint from 0 to 100 km/h in 4.8 seconds and hit a top speed of 250 km/h. The new BMW M4 Coupé comes standard with the Competition Package which increases the output of the powerful high-revving, turbocharged six-cylinder in-line engine by 19hp. The most passionate of drivers will appreciate the Seven-speed M Double Clutch Transmission Drivelogic with Launch Control which enables ultra-fast gear changes without any interruption in the flow of power. The BMW Head-up Display with M-specific functions such as a gear display, rev counter and Optimum Shift Indicator ensures the driver’s eyes are always kept on the road ahead. The new BMW M760Li xDrive gives debut to the new M Performance TwinPower Turbo 12 cylinder petrol engine. The 6.6-litre V12 engine, with output of 610 hp at 5,500 rpm and peak torque of 800 Nm at 1,500 rpm, accelerates the BMW M760Li xDrive from 0 to 100 km/h in just 3.7 seconds, with a top speed of 250 km/h. The standard Executive Drive Pro suspension system combines comfort oriented chassis tuning with active roll stabilisation to provide the most comfortable of rides.